Improve your computing comfort with 100% Perflex Gel for your wrists, elbows and forearms. Our ergonomically-designed Perflex Gel products are available in a variety of shapes and sizes and are the perfect addition to any computer workstation. Now even older chairs and mouse surfaces can be really comfortable. 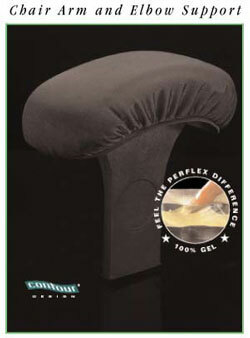 Introducing the new super soft PerFlex Gel covers-for chair arms. Contour Design, 354 N. Broadway, Salem, NH 03079. Tel: 603-893-4556; Fax: 603-893-4558.